A total of 17 records matched your search. Elf Fold from Foxwood Crossings contains 3 patterns stitched on Antique Brown Perforated Paper with stitch counts of 17w x31h using DMC/Anchor. 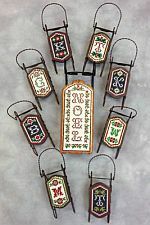 Small sleds are available for $6.95. 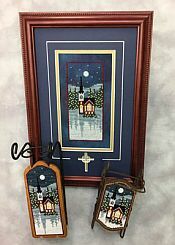 First Noel from Foxwood Crossings is shown stitched as an ornament or picture, ornaments range from 29w x51h, the picture is 35w x 110h. 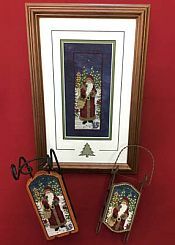 The ornaments are stitched on Antique Brown perforated paper and the picture is stitched on 14/28count Gothic fabric from Picture This Plus. 6 Weeks Dye Works hand-dyed fibers and 3 Gentle Art Sampler Threads are used with DMC alternatives. 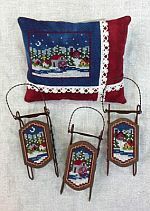 Harrisburg Winter from Foxwood Crossings is shown stitched as ornaments stitched on Antique Brown perforated paper with stitch counts of 29w x51h and the picture is stitched on 14/28count Gothic from Picture This Plus with a stitch count of 51w x 56h using 8 colors of Weeks Dye Works hand-dyed fibers, 3 colors of Classic Colorworks hand-dyed fibers with DMC alternatives. 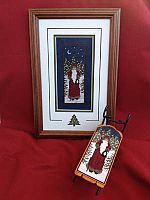 1 Kreinik gold metallic thread is used. 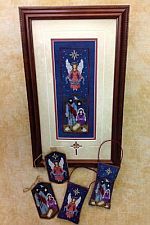 Oh Holy Night-Mini Sleds from Foxwood Crossings are stitched on Antique Brown Perforated Paper with stitch counts of 17w x 31h and using 7 colors of Weeks Dye Works hand-dyed fibers and 3 Gentle Art hand-dyed fibers with DMC alternatives provided. 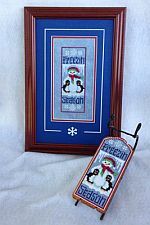 1 Kreinik gold metallic #4 Braid is used. 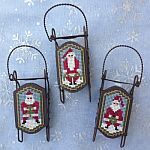 Santa Folk from Foxwood Crossings are stitched on Antique Brown Perforated Paper with stitch coungs of 17w x 31h using DMC/Anchor floss. 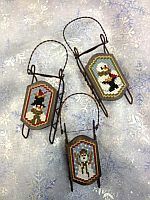 Small wooden sled ornaments are available for $6.95. 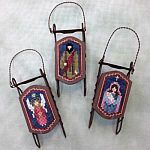 Sled Heads from Foxwood Crossings contains 3 designs shown stitched on Antique Brown perforated paper with stitch counts of 17w x 31h. DMC/Anchor floss is used. 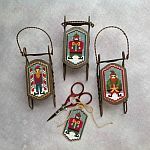 Snow Country Sleds from Foxwood Crossings are stitched on Antique Brown Perforated Paper with a stitch count of 17w x 31h and using DMC/Anchor floss. 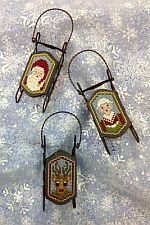 Small sleds are available for $6.95. 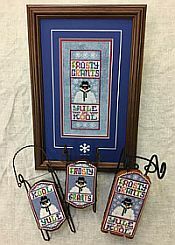 Snow Grateful from Foxwood Crossings contains 3 designs all stitched on Antique Brown perforated paper with stitch counts of 17w x 31h using DMC/Anchor floss. 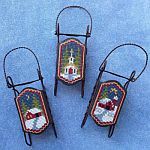 Small sleds are available for $6.95.